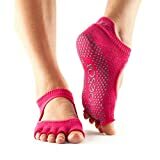 Patented non-slip grip keeps your feet in place, Arch support band gently lifts and supports, Fitted heel keeps sock in place to eliminate bunching and twisting. Five toe design allows toes to move and spread naturally. Half toe design lets toes touch surface for a more barefoot experience. Non Slip. Control. Balance. Hygienic alternative to bare feet.